ONI Bureau: — Odisha CM Naveen meets Ramnath Kovind in Delhi, says President will come on March 17th or 18th to inaugurate museum and school at Anand Bhavan in Cuttack in memory of BIju Babu. — Bijepur Bypoll: 72% voter turnout by 5 PM. Seems a very good figure. — The Board of Secondary Education bans use of Mobile Phones during Matric Examination. — Presiding Officer of Booth No. 193 suspended for trying to influence the voters in favour of a particular party. — BJP Team meets Governor; alleges Dileswar Sahu’s death is suspicious. “When VIMSAR Director said yesterday that there were no bullet injuries and all were stable, why Dileswar was brought all the way to SCB, Cuttack, which caused his death on the way,” the BJP asked. 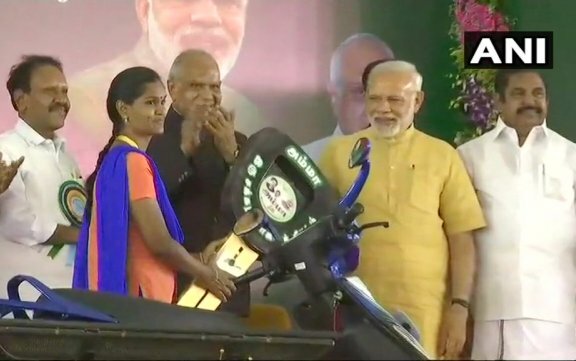 — PM Modi launches subsidized Scooty scheme for working women on the occasion of late Tamil Nadu CM J Jayalalithaa’s birthday in Chennai; launches various development projects at Daman. — PNB Scam: CBI is examining Punjab National Bank’s Chairman and Managing Director & Executive Director; NiravModi & Mehul Choksi’s passports revoked. — 20 Afghan National Army soldiers killed. — Aruna Reddy becomes first Indian Gymnast to win an individual medal in the World Cup.